In the summer of 1903, the husband and wife lecture team of Katharine and Charles Bowden travelled from Sault Sainte Marie, Michigan down the St. Mary’s River to a little jut of land then called Kensington Point, Ontario. Only a few miles south of the Canadian Pacific Railway stop at Desbarats, the Point was the site of a theatrical adaptation of Longfellow’s famous poem The Song of Hiawatha. Actors from the Garden River First Nation staged the play for the benefit of American and Canadian tourists as a way to increase ridership on the railway. The poem was then in a cycle of popular revival across the country. Situated close to the Ojibwe communities whose stories inspired Longfellow, the performance at Desbarats was promoted as the most authentic version. 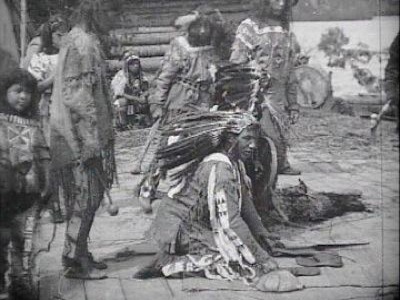 The Bowdens organized the films and photographs they took on that trip into a two-hour performance called A Pictorial Story of Hiawatha, From the spring of 1904 until 1910, the Bowdens presented the lecture in over twenty states to tens of thousands of spectators at small town opera halls, churches, school auditoriums, and under the expansive tents raised for summer Chautauquas. With Katharine regaling the audience from the stage, Charles operated the dual film/slide projector from amongst the crowd. In their illustrated lecture the region around the Soo and Desbarats was as much of a draw as the Hiawatha play. They discussed the technological wonders of the locks, displayed the thrills of the rapids on St. Mary’s River, recounted the history of the region and its relation to Longfellow’s poem, and in addition to the play, presented the outdoor entertainments at the Kensington Point. Katharine Ertz-Bowden was an early graduate of Valparaiso University in Indiana. In 1897 she earned a Diploma in Public Speaking with a BA in Science from Valparaiso, and a few years later she married fellow graduate Charles L. Bowden who had been an “expert photographer with Eastman Kodak.” After retiring from "entertainment” in 1910, Ertz-Bowden returned to Valparaiso University, working there as a librarian, associate professor and archivist. She passed away in 1965, leaving a collection of lantern slides, pamphlets, newspaper articles and 35mm film at the university. Original nitrate footage remains at Valparaiso University's Special Collections under the care of Judy Miller. CFA guided the preservation of the 5 rolls of film and currently owns and cares for the preservation materials.